Equine Polish Shine: Laser Sheen, ShowSheen, Detangler & Shine, Cowboy Magic, EQyss! • Hi Gloss Finishing Spray: Voted by the Horse Journal as the top pick for finishing sprays, Hi Gloss adds defined highlights to muscle and accentuates all colors. A light oil spray, it is a quick and easy way to get that last minute sheen before entering the show ring. Hi Gloss adds a clear coat of shine to any color and is convenient in a daily grooming routine to condition skin and coat. Available in a quiet 12 oz. aerosol can with a pleasant strawberry fragrance. 12 oz. sprayer. #08024. ORDER NOW! • Magic Sheen Hair Polish: Voted by The Horse Journal as a top choice for producing a maximum, oil free shine that will last for several days. Magic Sheen hair polish is a specially formulated silicone blend that produces maximum shine and a lustrous, healthy coat. Our unique formula can be used on wet or dry hair to easily detangle and condition mane and tail. Magic Sheen will give your horse’s coat the feel of satin and reduce grooming time by coating the hair shaft and repelling dirt and stains. 32 oz. Sprayer. ORDER NOW! • No.1 Light Oil: No.1 Light Oil adds a light shine to the coat, enhances the face, and adds conditioning oils to skin. No. 1 Light Oil is helpful while pulling a mane when applied to the base, or while shedding out coats by allowing hair follicles to slip out without irritating the skin. When detangling manes and tails, use No. 1 Light Oil to loosen knots and mats. 32 oz. ORDER NOW! Show Touch Ups: Created exclusively by Shapley’s, Show Touch-Ups are color-enhancing sprays designed to safely and effectively conceal stains, scars, blemishes, and flaws. Show Touch-Ups cover completely and will produce a wide range of color depending on the number of coats applied. The colors will not smear, clump, rub off or damage the coat. Show Touch-Ups can also be used to enhance tails and feathered legs, creating a full, natural look. ORDER NOW! • Show Touch Ups: Black. 12 oz. Aerosol can. ORDER NOW! • Show Touch Ups: White. 12 oz. Aerosol can. ORDER NOW! POLISH/SHINE: Hi Gloss Finishing Spray, 12 oz. POLISH/SHINE: Show Touch Ups, 12 oz. • Laser Sheen Dazzling Shine & Detangler Concentrate: Laser Sheen Dazzling Shine & Detangler is a show-stopping, high-gloss formula offers a glowing shine and flowing mane and tail. Laser Sheen Dazzling Shine & Detangler helps detangle manes and tails, leaving them shinier and more manageable. Won't make hair brittle and minimizes breakage. Repels dust, dirt and stains to cut grooming time in half. Show-ring shine lasts a week! 12 oz. concentrate. #45912. ORDER NOW! • Laser Sheen Dazzling Shine & Detangler Ready-to-Use: The same popular, high-tech formula as the concentrate, but requires no mixing; convenient to apply anywhere, anytime. Keeps horses' coats glossy, and mane and tail free of tangles for up to a full week. 32 oz. ready-to-use with trigger sprayer. #45904. ORDER NOW! • Laser Sheen Volume Enhancing Detangler: Laser Sheen Volume Enhancing Detangler helps restore moisture and strength to reduce breakage and split-ends. Helps increase hair control by eliminating knots and tangles. Increases volume for a thick, flowing mane and tail. Laser Sheen Volume Enhancing Detangler contains PABA sunscreen helps protect hair from fading and environmental damage. Non-greasy, so it won't attract dust or dirt. pH balanced. 12 oz. ORDER NOW! • Vetrolin Shine: Vetrolin Shine is a ready-to-use spray contains salon-quality Silicone to improve the shine of any color coat. Vetrolin Shine is made with Vitamin-rich conditioners keep manes and tails manageable and tangle-free and reveal a long-lasting, healthy sheen to your horse's coat. Vetrolin Shine contains PABA sunscreen to help prevent bleaching and protect from wind, weather and sun. Won't dry out or damage hair and minimizes breakage. Provides a brilliant shine and repels stains, dust and dirt keeping your horse looking his best. Contains the fresh herbal Vetrolin scent. Great for dogs, too! 32 oz. ready-to-use spray. #80307. ORDER NOW! POLISH/SHINE: Laser Sheen Dazzling Shine & Detangler Concentrate 12 oz. POLISH/SHINE: Laser Sheen Dazzling Shine & Detangler Ready-to-Use Spray 32 oz. POLISH/SHINE: Laser Sheen Volume Enhancing Detangler, 12 oz. POLISH/SHINE: Vetrolin Shine, 32 oz. ShowSheen® Hair Polish & Detangler: ShowSheen Hair Polish & Detangler is the world’s #1 horse hair detangler and perfect for everyday grooming. Highlights coat color and muscle definition. ShowSheen Hair Polish & Detangler offers a healthy gloss and Helps cut grooming time in half. ShowSheen Hair Polish & Detangler is an brilliant horse hair detangler for snarled manes and tails, and exceptionally versatile. ShowSheen Hair Polish & Detangler is made with pro-vitamins to nurture coats and silk proteins to fortify manes and tails and encourage stronger, longer hair. Repels dirt and dust to help horses stay cleaner longer and helps reduce static. Prevent stains, manure, grass, and urine. mud from sticking. Features light, mild fragrance of soothing Jasmine and relaxing Sandalwood to give you and your horse the best performance or ride. • ShowSheen Hair Polish & Detangler: 32 oz. Trigger Spray Bottle. #428891. ORDER TODAY! • ShowSheen Hair Polish & Detangler: 32 oz. Refill Bottle. #428793. ORDER TODAY! • ShowSheen Detangler Gel: ShowSheen Detangler Gel helps untangle the toughest knots and deep condition matted manes and tails. , ShowSheen Detangler Gel is made with Argan Oil of Morocco to deep condition, nourish and hydrate hair. ShowSheen Detangler Gel is pleasantly fragranced for a high-gloss, silky-soft finish that lasts for days. Leaves no residue and can be used with wet or dry hair. Infuser applicator allows targeted use, making it easy to apply to tangles and knots. 4 oz. Squeeze Bottle. ORDER TODAY! • Santa Fe Coat Conditioner: Specially formulated by hair care professionals and top groomers to out-shine, out-clean, and out-perform all other grooming products on the market. Enriched with silk proteins to revitalize coat, mane, and tail. Formulated with Vitamin E, panthenol, and SPF 8. Saddle-area safe and repels dust and dirt. 32oz. Trigger Spray Bottle. #441225. ORDER NOW! • Miracle Groom: ShowSheen Miracle Groom is an all-in-one waterless horse shampoo that cleans, conditions, deodorizes, detangles, and shines—no rinsing or extra water required. ShowSheen Miracle Groom is ideal for cold weather and waterless bathing, from total body cleaning to last minute spot removal. Lifts stubborn dirt and dust from the coat, mane, and tail. Quickly removes manure stains and sweat lines, and brightens color. Maintains a clean shine without greasy residue. Safe for use on all short and long hair animals. 32 oz. Trigger Spray Bottle. #427960. ORDER NOW! POLISH/SHINE: Santa Fe Instant Detangler, 32 oz. POLISH/SHINE: Miracle Groom, 32 oz. Detangler & Shine: Detangler & Shine is not an oil or a cream rinse and is not affected by water or liniment baths. Infused with all natural herbal extracts. Detangler & Shine helps eliminate tangles and knots offering effortless grooming, and reduces grooming time. Provides a lustrous shine on coat, mane and tail that lasts for days. Detangler & Shine delivers a smooth and sleek coat, and helps repel dust, dirt and stains, keeping your horse cleaner longer. Perfect for cold weather use for touch ups. Pleasant tropical fragrance. Made in the USA. • Detangler & Shine: 8 oz. sprayer. ORDER TODAY! • Detangler & Shine: 32 oz. sprayer. ORDER TODAY! Detangler & Shine: 8 oz. aa aaDetangler & Shine: 32 oz. POLISH/SHINE: Detangler & Shine 8 oz. POLISH/SHINE: Detangler & Shine 32 oz. Detangler Spray: Friction free slip for reduced grooming damage. Conditions and fortifies hair strands. Keeps hair manageable for grooming and braiding. Helps achieve and maintain longer, healthier manes and tails. Works effectively on wet or dry manes and tails. Pleasant non-fragranced, non-sticky formula. • Detangler Spray: 16 oz. ORDER TODAY! • Detangler Spray: 32 oz. ORDER TODAY! • Spray N' Braid: Spray N' Braid for tighter braids, neater banding and easier mane training. No slip “grip” for easy braiding and banding. Eliminates flyaway strands for perfect looking braids. Protein enriched; strengthens hair, helps prevent breakage. The ultimate solution for training manes and tails to lay flat. Water based pH balanced formula; pleasant scent. Ergonomic bottle for easier handling. 16 oz. sprayer. ORDER TODAY! • Mane & Tail Spray Away Horse Wash: A quick-cleaning, gentle body wash has long been a horse owner's dream. The problem with other formulas has been harsh results: dried out skin and coat, as well as a mane and tail left feeling like straw. Now the dream has finally come true! Exclusive combination of quick-cleaning natural plant esters & surfactants. Cleans thoroughly without scrubbing, safe & gentle enough to use everyday. Essential oils & proteins, condition & replenish the hair's natural body & shine. Thorough cleaning eliminates fungal & bacterial food sources for healthier skin. pH balanced for sensitive skin can be used over cuts and scrapes. 32 oz. ORDER TODAY! 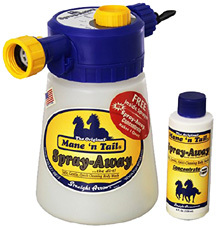 • Mane & Tail Spray Away Hose End Sprayer: Spray Away Hose End Sprayer is a quick, easy to use, and adjustable sprayer attachment for use with equine body washes. Spray Away Hose End Sprayer may be used with both concentrates or ready-to-use products. 36 oz. capacity. FREE Spray Away Concentrate 4 oz. (makes 1 gallon). ORDER TODAY! Spray Away Horse Washaaa aaaHose End Sprayer plus Concentrate 4 oz. POLISH/SHINE: Mane & Tail Spray Away Horse Wash 32 oz. • Silverado Coat Gloss: A ready to use, spray-on highlighter for the horses coat, mane and tail. Silverado Coat Gloss™ produces the best show ring shine for the coat, mane and tail. repels dust, dirt, grass, urine, leather , and manure stains. Cuts grooming time in half! Groom once, horses stay clean and show ring ready for days longer! Spray horse's coat, mane and tail, brush or towel into coat. Comb and de tangle mane and tail. Mist entire horse, mane, tail and coat lightly again. 32 oz. Sprayer. #SCG32. ORDER TODAY! • Super BodyShine: Super Bodyshine provides hair a super shine. Helps repel show ring dust and dries fast. Super Bodyshine dries fast and reflects a full spectrum of light resulting in a maximum body shine under sun or show ring lights. Made with Aloe Vera to fortify and condition hair and skin. Super Bodyshine will not become gummy and sticky after days of use, reducing the number of trips to the wash rack. Super Bodyshine is concentrated and ready to use. 32 oz. sprayer. #08024. ORDER TODAY! Ingredients: Water, Aloe Vera, Aqueous Emulsion of Polyorganosiloxanes, Chamomile Extract, Polysorbate-20, Retinyl Acetate, Tocopheryl Acetate, Ergocalciferol, Methyl Paraben, Propyl Paraben, Imidazolidinyl Urea, Fragrance. • Shine in Yellow Out: Neutralizes yellow stains and brightens hair of all colors: Black, White, Chestnut, Bay Brown, Roan, Palomino, Paint. Helps take yellow stains out of hair and gives dull hair of every color a more brilliant sheen. It leaves hair silky, shiny and smelling good. 16 oz. ORDER TODAY! • Green Spot Remover: (Shower in a Bottle) Helps remove manure and urine spots instantly. Helps remove wet or dried sweat instantly. Give those newly cleaned spots a high-shine after brushing. It is concentrated: Greenspot® Remover/Shower in a bottle is made from very expensive, natural, non-sudsing cleaners derived from plants. We have added silk and panthenol to strengthen the hair and deep conditions the skin. We have added shea butter to make it possible to brush up a shine after drying. It works on people too: Greenspot® Remover/Shower in a Bottle is great for campers and mountain bikers who want to clean up dirty, smelly bodies without using lots of water. The only water needed is to wet the towel to activate the ingredients that break down the sweat or dirt. Follow up with a dry towel to remove the sweat or dirt. 32 oz. sprayer. ORDER TODAY! Ingredients:Water, Sodium Laureth Sulfate, Cocamide DEA, Cocamidopropyl Betaine, Glycerin, Shea Butter, Honey, Rose Flower Extract, Sage Leaf Extract, Rosemary Leaf Oil, Thyme Oil, Nettle Extract, Matricaria Flower Extract, Peppermint Leaf Extract, Lavender Oil, Comfrey Extract, Horsetail Extract, Witch Hazel, Tetrasodium EDTA, Polysorbate 20, Propylene Glycol, Diazolidinyl Urea, Methylparaben, Propylparaben, Fragrance. Detangler & Shine: Concentrated formula as it conditions, contains no water or alcohol, does not dry hair.Works instantly and detangles as you rub it in and keeps on working, resulting in less grooming time and less product used, saving time and money. A deep conditioner that penetrates below the surface and restores moisture while strengthening hair, resulting in a natural shine with a soft texture. Long lasting as it repels dirt, dust, and sand, resulting in a shine that lasts longer. Not oily. Neutralizes static electricity and instantly detangles hair that is difficult to brush and comb. Minimizes hair loss due to pulling and breakage. A small amount (about the size of a nickel) massaged into wet or dry hair will instantly detangle and deep condition. ORDER NOW! • Detangler & Shine: 4 oz. #1012. ORDER NOW! • Detangler & Shine: 16 oz. #1012. ORDER NOW! • Detangler & Shine: 32 oz. #1032. ORDER NOW! Ingredients: Deionized Water (Infused with Extracts of Rose, Sage, Rosemary, Thyme, Nettle, Chamomile, Seaweed, Lavender, Mint), Lauryl Methyl Gluceth-10 Hydroxypropyidimonium Chloride, Cetearyl Alcohol, Ceteareth-20, Cetyl Alcohol, Steralkonium Chloride, Hydrolyzed Silk, Tetrasodium EDTA, Octyl Methoxycinnamate, Isopropyl Alcohol, Methylparaben, Propylparaben, Imidazolidinyl Urea, Fragrance. POLISH/SHINE: Super Body Shine, 32 oz. POLISH/SHINE: Shine in Yellowout, 16 oz. POLISH/SHINE: Cowboy Detangler & Shine, Concentrate 4 oz. POLISH/SHINE: Cowboy Detangler & Shine, Concentrate 16 oz. 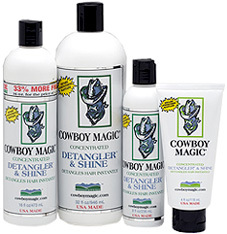 POLISH/SHINE: Cowboy Detangler & Shine, Concentrate 32 oz. • Avocado Mist Conditioner Detangler: Botanical oil-free, silicone free LEAVE ON conditioning spray that maintains the moisture balance within the hair shaft. Avocado Mist prevents the mane and tail from becoming dry, brittle, and breaking off. It is the ONLY equine conditioner that does not contain oil, silicone, wax, or synthetic polymers. Shines, detangles, and conditions mane, tail, and body. Detangles without the heaviness common in most conditioners. Promotes healthy silky shine and eases grooming. Can be left on, or rinsed off. Reduces hair breakage. Can be used wet or dry. Anti-static. Not slippery, not sticky, not slimy. NON-TOXIC, ALCOHOL FREE. 32 oz. sprayer. #10265. ORDER TODAY! • Survivor Super Detangler Shine: A unique blend of special, new ingredients creates the greatest detangler and shine product ever developed. Brushing will be tangle free. A combination of natural emollients minimizes flyaways and smoothes hair cuticles to replenish each strand. Leaving hair soft, shiny and tangle free. Brightens colors. Shines and detangles. Can be used wet or dry. Leave in. Alcohol-free. Works on any knot, burr or tangle. 8 oz. #10245. ORDER TODAY! • Premier Rehydrant Spray: Use whenever you brush your horse. It's not silicone, it's a botanical spray that does not coat or damage your horse's skin and hair. Developed specifically to bring moisture captured from the air to the coat at an accelerated rate over a long period of time (24 hours). If the hair is not coated with oil, moisture goes through the hair to the skin, and the skin respirates better. It is not slippery and does not attract dirt and dust. It is NON-TOXIC, it won't burn the eyes, and is hypoallergenic. Conditions and moisturizes coat. Prevents dry skin conditions. Promotes healthy skin and coat. Can be used on saddle area. Tearless formula will not hurt eyes. Enhances color. Detangles mane and tail. Repels dust and dirt. 32 oz. #10250. ORDER TODAY! POLISH/SHINE: Avocado Mist Conditioner Detangler, 32 oz. Survivor Super Detangler Shine, 8 oz. Premier Rehydrant Spray, 32 oz. • Quic Braid: Quic Braid has revolutionized mane management. Not sticky like hair spray, nor slick like human styling products, Quic Braid gives you the perfect “grip” while braiding and banding. Use Quic Braid for tighter braids and neater bands with minimal stray hairs. Best of all, you don’t need to wash it out - Quic Braid dries leaving the hair feeling soft and natural... and it combs out beautifully, for days of easy mane management. Quic Braid is also great for mane training. Perhaps Susan Harris, noted author of Grooming to Win, said it best, “I think Quic Braid is a product we’ve needed for a long time, and it belongs in every show groom’s tack trunk!” 16 oz. sprayer. #Q816. ORDER TODAY! POLISH/SHINE: Quic Braid, 16 oz. • Omega Shine Coat Conditioning, Detangling & Revitalizing Spray: A non-aerosol, conditioning and revitalizing spray that enhances the softness, manageability, luster and shine of your animals coat leaving it fresh and with a clean fragrance. Does not contain any Mink Oil, Lanolin or any other animal by-products, but rather a variety of natural, organic and botanical moisturizers to help reduce skin flaking and protect against static (fly-away), tangling, matting and moisture depletion. 16 oz. sprayer. #Q816. ORDER TODAY! POLISH/SHINE: Omega Shine Coat Conditioning Spray, 16 oz. • Corona Detangler & Shine: Corona Detangler & Shine offers SPF protection to help prevent from the sun-bleaching of manes and tails. Instantly loosens tangles and leaves a soft, smooth, and shiny finish. Corona Detangler & Shine helps repel dust, dirt, and stains to keep your horse looking its best. 32 oz. Sprayer. ORDER TODAY! POLISH/SHINE: Corona Detangler & Shine, 32 oz. • EZALL Show-n-Go Shine & Conditioner: EZALL Show-n-Go Shine & Conditioner is a leave-in conditioner that provides the coats of your horses and livestock shine and control. EZALL Show-n-Go Shine & Conditioner spray helps hair follicles repel dust and dirt and leaves hair coat glowing for days. Judges are sure to take note when you and your animal step into the show ring! NO SILICONES! 32 oz. ORDER TODAY! POLISH/SHINE: EZALL Show-n-Go Shine & Conditioner, 32 oz. • E3 Detangles & Shine: E3 Detangles & Shine helps eliminate tangles and knots while leaving the ultimate shine. Made with Nano-Encapsulated ingredients to fortify the hair, restore moisture and prevent hair damage from UV rays. E3 Detangles & Shine helps deeper penetration and absorption' and leaves hair easier to clean. Non-oily and no sticky mess. 32 oz. ORDER TODAY! POLISH/SHINE: E3 Detangles & Shine, 32 oz.